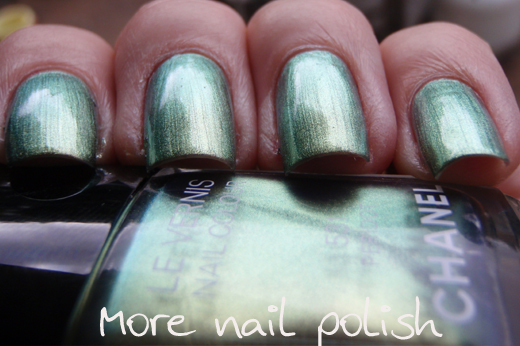 Would you believe that one of the top search terms for people coming to my blog is 'magnetic nail polish'. 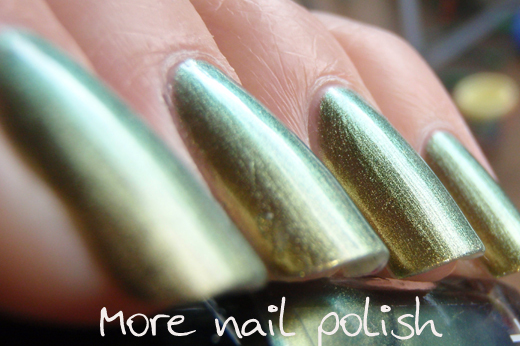 So if you just googled magnetic nail polish and came here, welcome! I recently hauled myself three new magnetic colours from the same place that I have purchased my previous magnetic polishes (Nail Art and More in Austria). This one is called Magnetic Silver Grey. 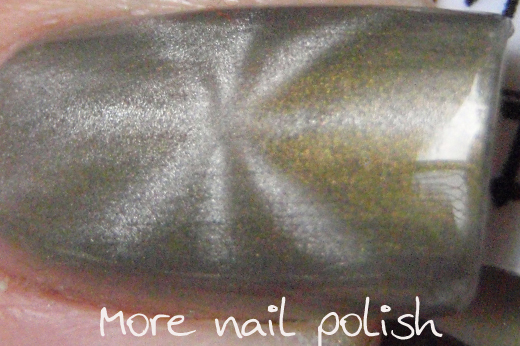 When the polish is applied it is a neutral taupe gray colour, but when the magnetic is applied it pulls through a great gold colour beneath and leaves very light silvery magnetic lines. I used the star magnet for this design, and like always I had a little trouble lining it up perfectly on my nail, but I still got a finish I was very happy with. 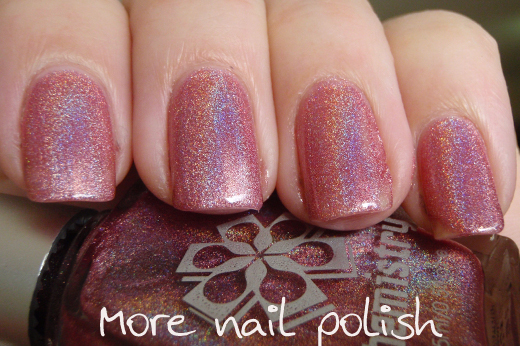 This is a really pretty magnetic polish. The other two colours I got were Khaki and Pigeon blue. I'm worried the khaki might look a bit poopie, but they didn't have a colour chart, so I'll just have to wait and see. I also got two more magnets, one with horizontal lines and one with vertical lines. I'll use them on the other two colours. 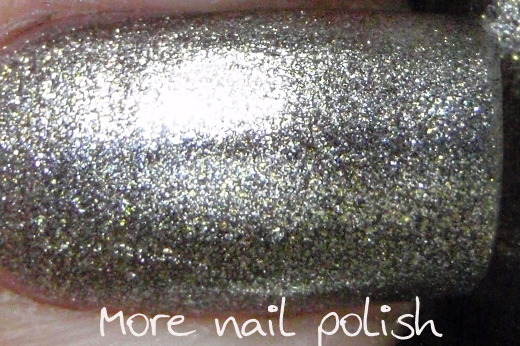 I only have two polishes left that I swatched before I had a break on my ring finger. So enjoy my longer nails why they are here. I haven't nubbinised all fingers yet, but I think I will have to cause they look strange. 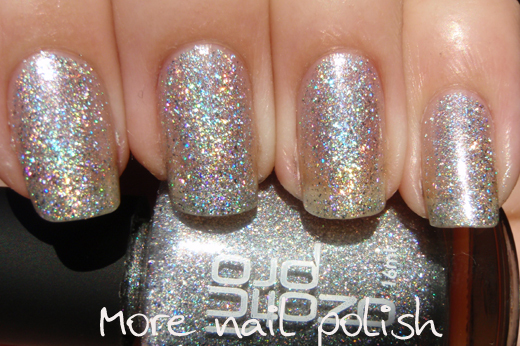 Today I'm finally getting around to showing you Ozotic 609, silver scattered holo goodness. 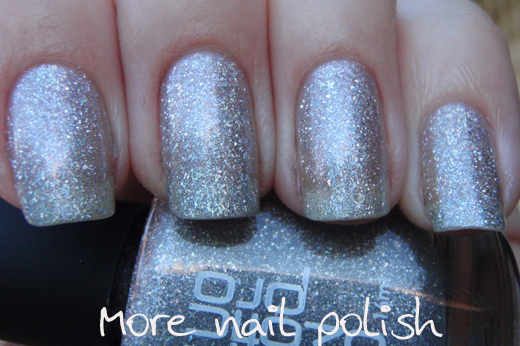 I did include this in my silver holo comparison a week or two back. 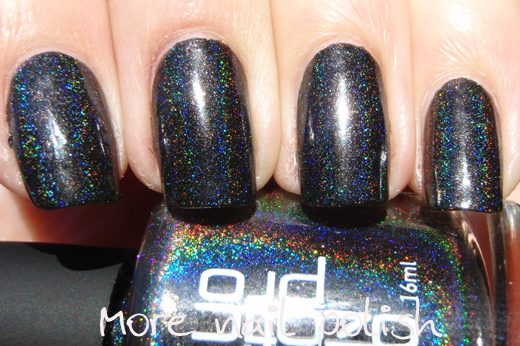 In that comparison 609 didn't look very holo. I don't know if that is because it was on the perspex stick and not a nail, but as you can see, on the nail it still looks fantastic. 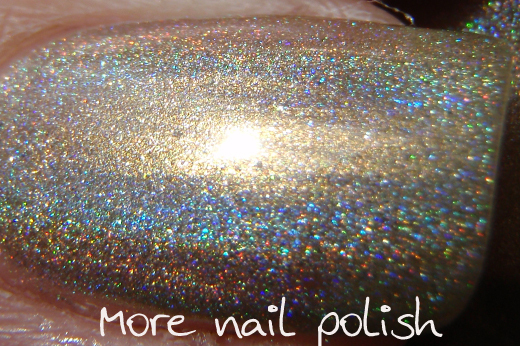 This was three coats, and there is still some visible nail line, especially in the indoor photo, but when viewed under any stronger light source the rainbow reflections are strong enough not to see the nail line in real life. For some reason my ring finger looks a lot sheerer than the other fingers. I wonder if I forgot to put the third coat on that nail? Here is the indoor shot, actually I think it was an outside shot but in the shade. 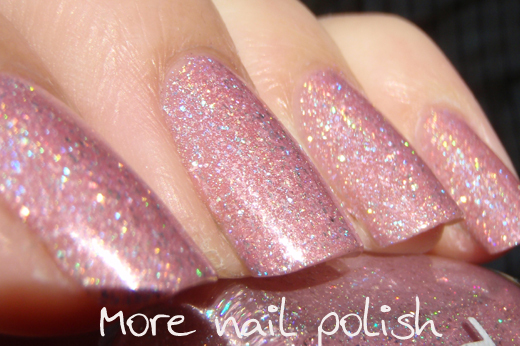 I love the irregular shaped holo pieces. 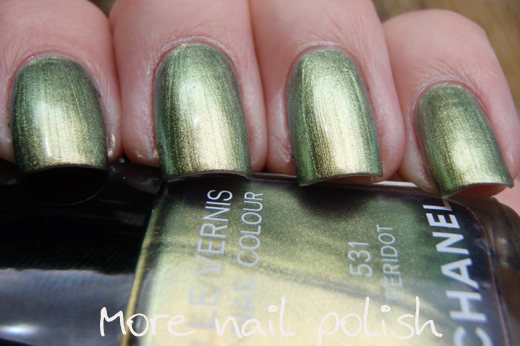 The bottom line is the colour changing powders still have not arrived. I suspect that they might be caught up at Customs. Because I had to order so much ($1300+ worth of powder), and the $$ amount would have been written on the customs declaration, the the parcel has probably been diverted to Australian Customs. I now have to wait for Customs to send me a letter telling me how much extra money I have to pay to get the powders released (customs duty of 5% and GST of 10% - DOH!). Once I pay that, they will release the package to me. You only have to pay duty if the product is valued at over $1000 and it never occured to me when I placed my order that I would have to pay Customs duty and GST because of the amount I ordered. If I had ordered two seperate amounts a few weeks apart, both orders would probably have come through ok.
Oh well. Lesson learned. Profit margin slashed! At least the wait and the anticipation will make it that much more exciting for everyone when it does arrive and you can all start frankening. Also, except for the 13 lucky ladies that got my original batch, no one else has received it yet, so you will all get it at roughly the same time now. I also believe the same thing will happen (or has already happened) with the Spectraflair. 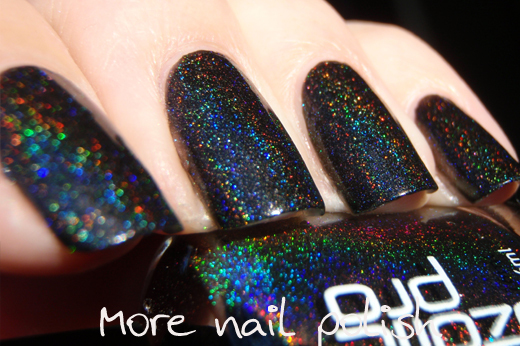 Hello black linear holo!! 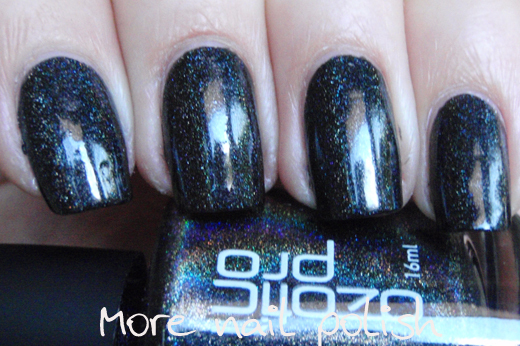 Today I have a swatch of Ozotic 526, but I also just got the new black scattered holo version, Ozotic 623. After I swatch 623, I'll do a comparison swatch of the two black ozotics, my Glitter Gal black and my black spectraflair franken. So please stay tuned for that. 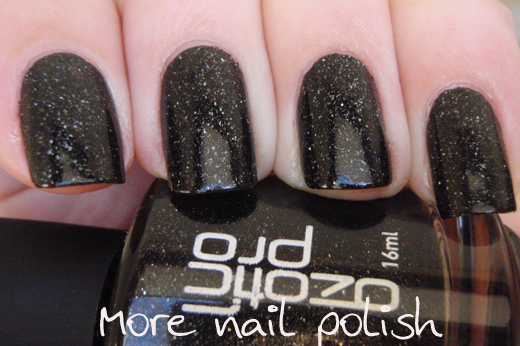 Now on to Ozotic 526. 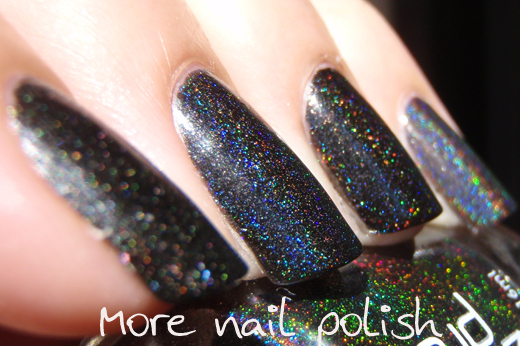 This is your classic black with fine holographic particles. 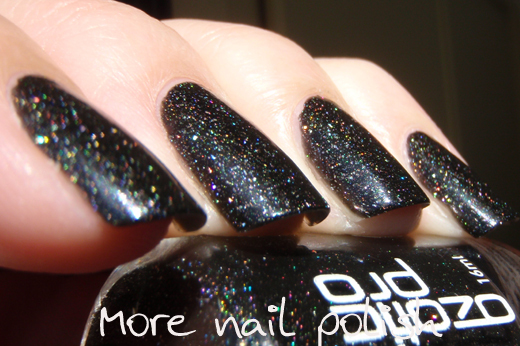 I'm looking forward to doing my comparison swatch and particularly comparing this with Glitter Gal black. 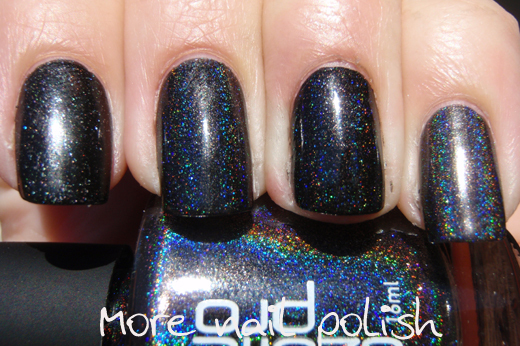 I remember being underwhelmed by Glitter Gal black when I first put it on my nail because the holo effect was really poor. 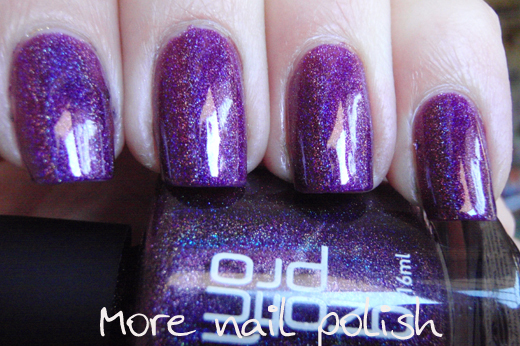 Because of the dupy nature of a number of the Ozotic and Glitter Gal colours, I wasn't expecting much from this. 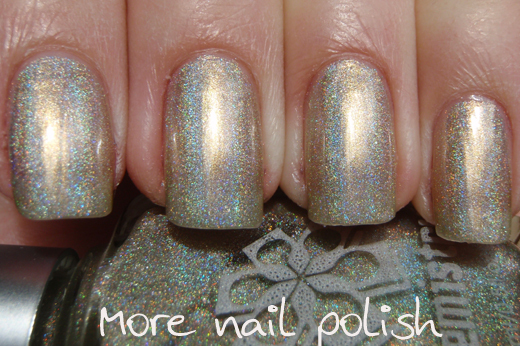 But I was so extremely happy to see a decent amount of linear holo on the nail. I don't own the original MPJ (I have the brown version, which I actually quite like), but I think this would be a great substitute for anyone lemming original MPJ. Even with the indoor shot below, you can still see the holo particles, their not rainbowy, but they are there. 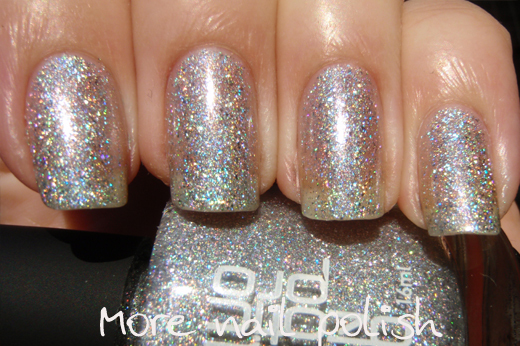 This actually looks amazing in the bottle, and when on the nail you don't quite get as much holo, but it is still pretty good. 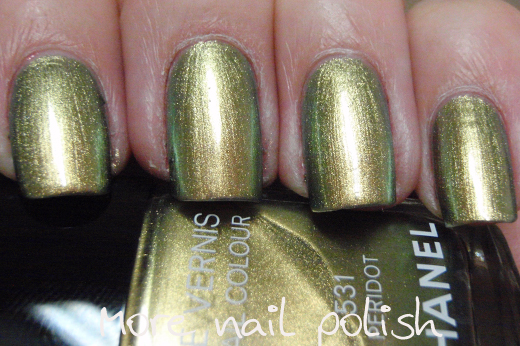 This is very opaque, you could almost get away with one coat. But I feel a bit naked with only one coat, so I did two. 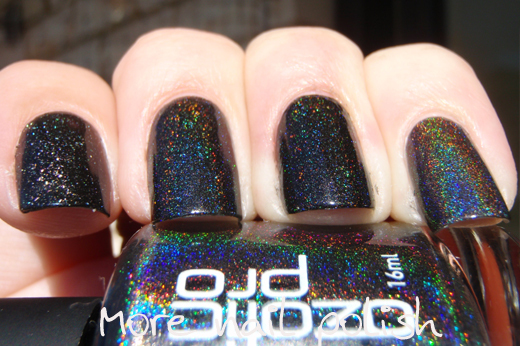 In fact it is pretty amazing that a polish this opaque can still be this holo, usually you need a rather sheer jellyish polish to get a good holo effect. I'm very tempted to use this as the black base when I need one for layering, such as under the ozotic multichromes. 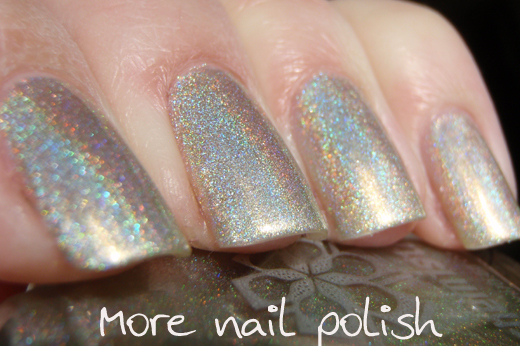 Chemistry 514 would have to be one of my very favourite holographic polishes. It's a very cool toned platinum gold fine particle linear holo. It's almost silver, but there is enough yellow tones in it to be able to see the difference. Unfortunately I haven't seen an Ozotic version of this yet, which is a shame, cause that makes it near impossible for people overseas to get it. Not that Essential Distribution have this in stock at the moment either, an email from them on Friday said they only had in 512 stock right now. 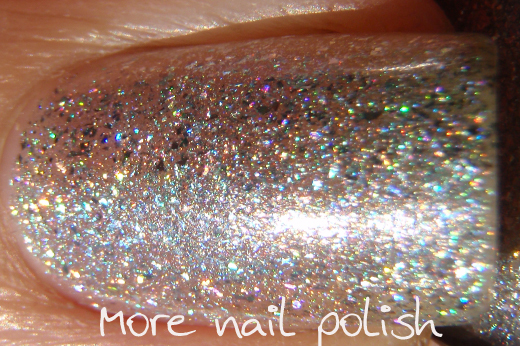 This one did take a bit longer to dry than the other holos, so it's lucky that the holo effect isn't dulled by a fast dry top coat. 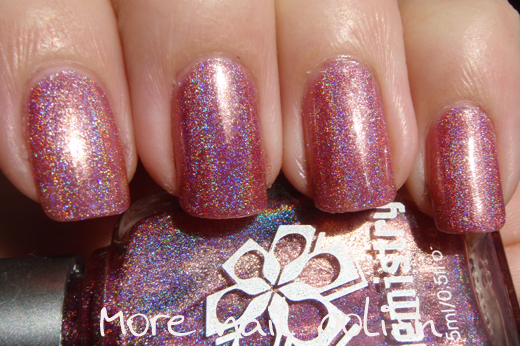 The holo effect in this doesn't look quite as in your face as some of the other Chemistry/Ozotic holos, but it is still amazing. Oooh, ooooh , ooohh, I just noticed I have 1000 followers today. That's really cool. Thank you so much everyone for coming by and following my blog. 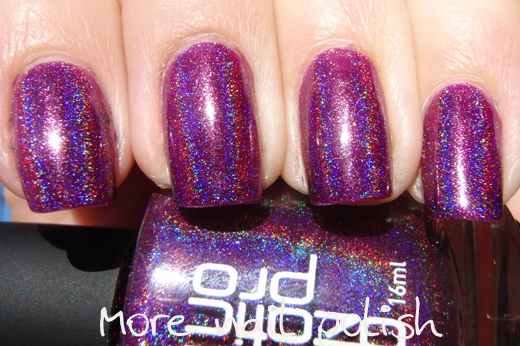 I do have three piCture pOlish shades to give away, so I'm planning on combining the giveaway for 1000 followers with a giveaway that will show case of all my followers (soon to be created) frankenpolishes made with either spectraflair or the colour morphing powders. So once the powders arrive, and have been shipped, I'll give you a few weeks to create something and will then hold a giveaway. Please stay tuned for that! I have a real popular one today. 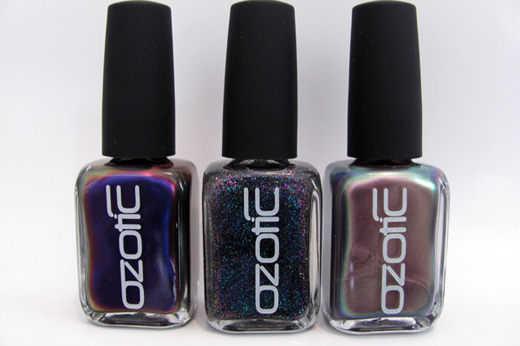 This is Ozotic 513, the rich purple fine particle linear holo. 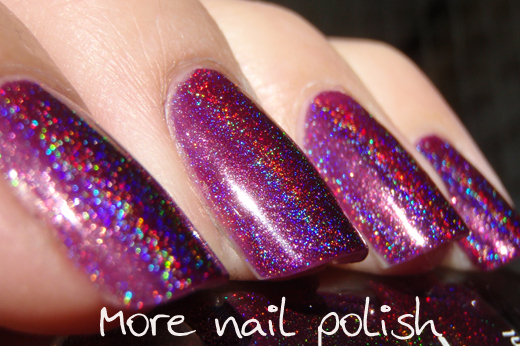 This is a red toned purple with a massive amount of holo sparkle to it. 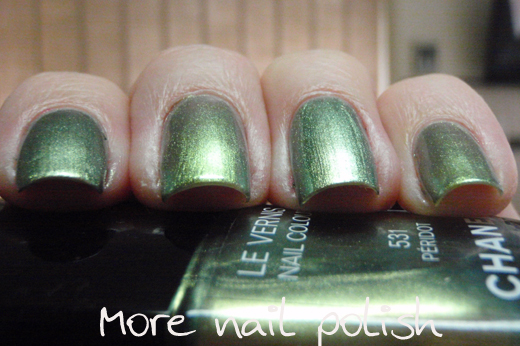 This was three coats, no base or top coat. 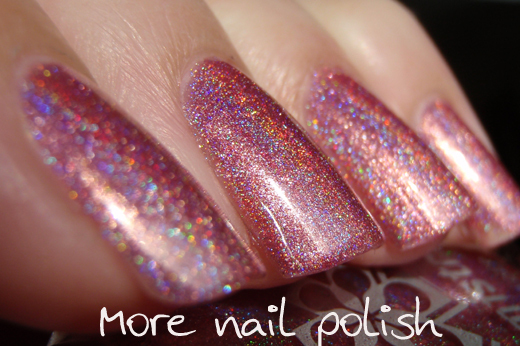 As you can see these fine particle holos dry to a super glossy finish, and also still show a subtle holo effect indoors. Lazy arse post tonight, sorry. My mind is blank as far as anything interesting to write. I'm flying up to Brisbane tomorrow morning for a few quick day's with the in-laws so my head isn't in the blogosphere at the moment. It's too busy running though last minute things I have to do, like making sure I take the compost outside so I don't return home to a stinky house! Brissy gals, any favourite polish haunts that I should be checking out while I'm there? Do you know of any stores that stock Chemistry or B-Range (in Brissy or Gold Coast) that I could pick over?